Belfast-based four-piece Girls Names are a singular proposition, both geographically and psychically removed from their contemporaries at home and abroad. Released in February 2013, their second album 'The New Life' is the sound of a band on the fringes striving to forge their own path, purposefully out of step - and time - with their surroundings. Weighed heavy with the grey landscapes of their hometown, 'The New Life' is isolation laid bare, shot through with an undeterred sense of purpose and individuality. 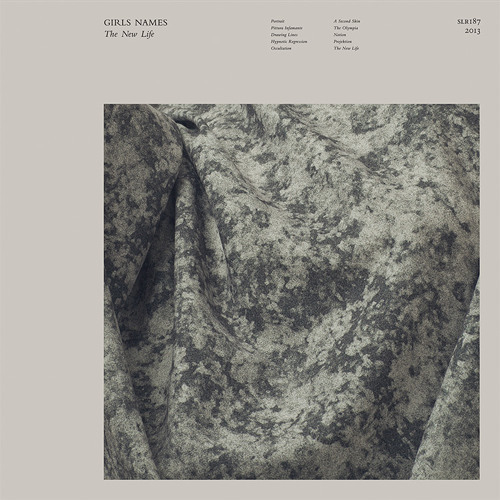 Having released a series of singles and EPs on various independent labels, Girls Names made their first significant impression on the wider world in 2011 with their debut album, 'Dead To Me,' earning plaudits from the likes of Pitchfork, NME and Loud & Quiet amongst a host of others. And yet, despite all the praise heaped on it, as soon as that record was released Girls Names were already moving into a different headspace. The band’s performance at this year Primavera festival provided them with their first real opportunity to showcase the songs that were to comprise 'The New Life.' The sunshine backdrop of the Spanish coastline offered a somewhat incongruous setting to the eerie dissonance of the new material, a kind of trial by fire metamorphosis rapturously received. Following a tour of Europe, the band returned home to record the album over a series of months. Having been produced by singer and songwriter, Cathal Cully, they’ve managed to capture that sense of otherness the performances at Primavera hinted at. The expansion to a four piece means the garage-clatter of the spritely pop songs of their debut have been replaced by a deeper, shadowy exercise in catharsis, driven by repetition, psychedelia and Dionysian crisis. And the record was born of a weighty concept too, as Cully explains: “'The New Life' is not an over night change for Girls Names - just over two years in fact. 'Dead to Me' literally was dead to us by the time it was committed to wax. But it's a learning curve. We started moving on as artists the moment we finished that recording session, maybe even before. Not to dwell on the past, 'The New Life' is what happens when you reset everything back to zero and start again, but try to perfect. It starts back at zero the minute the needle hits the groove but we're also starting back from zero once the needle lifts at the end of the record. Ad infinitum. 'The New Life' is what follows now.” The album’s title track, and the first single to be taken from the album, is an ideal entry point. Just shy of 8 minutes long, it rotates around a hypnotic bass line, and in Cully’s evocation of renaissance, offers a perfect metaphor for the album as a whole. New single ‘Hypnotic Regression’ - available to stream today - reflects another side to the record. The reverb-heavy guitars and compelling melody are immediately memorable, but there are signs of experimentation, too; the white squall of the lead break; the uneasiness in the vocal echoes that furnish the verses. As such, 'The New Life,' stands as a brave statement; the mark of the band untying themselves from the past and easing forth into the unknown. "The New Life" will be released on February 18th, 2013 on Tough Love (UK) and February 26th, 2013 on Slumberland Records (US). Great chord progression, reminds me of Johnny Marr. My compliments to the chef! @oldcoldsoul: this is a new song? Reminds me of the Crystal Stilts for all the right reasons - excellent.